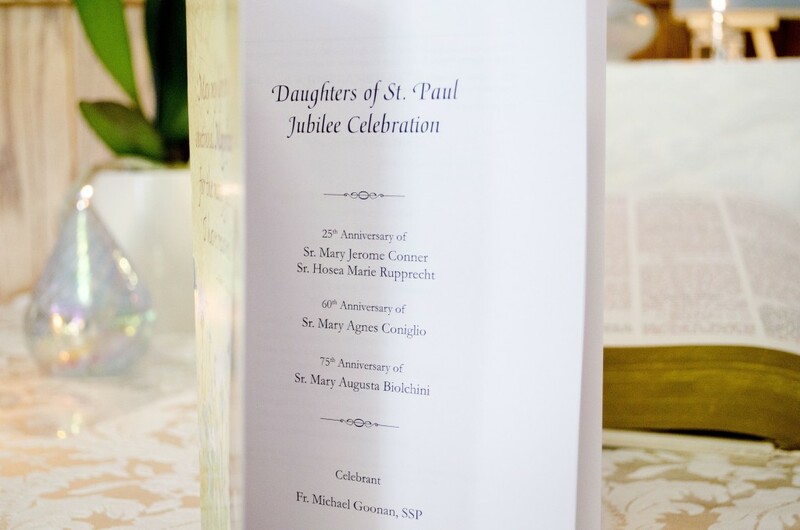 Browse > Home / Daughters of St. Paul, Your News and Events Blog / Daughters of St. Paul Celebrate Profession Jubilees 2015…25 years, 60 years and Yes…75 Years! 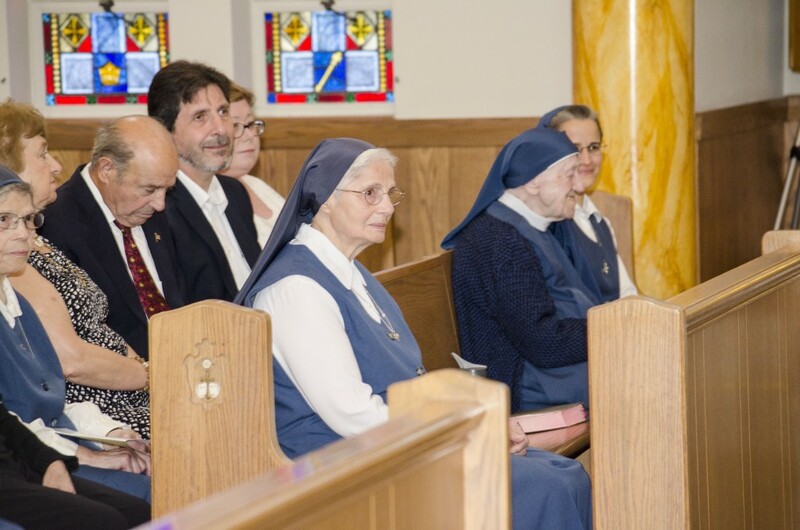 On July 25, 2015, the Daughters of St. Paul celebrated Profession Jubilees of two Sisters who took their vows 25 years ago, 1 sisters who took her vows 60 years ago and believe it or not, one sister who took her vows 75 years ago! 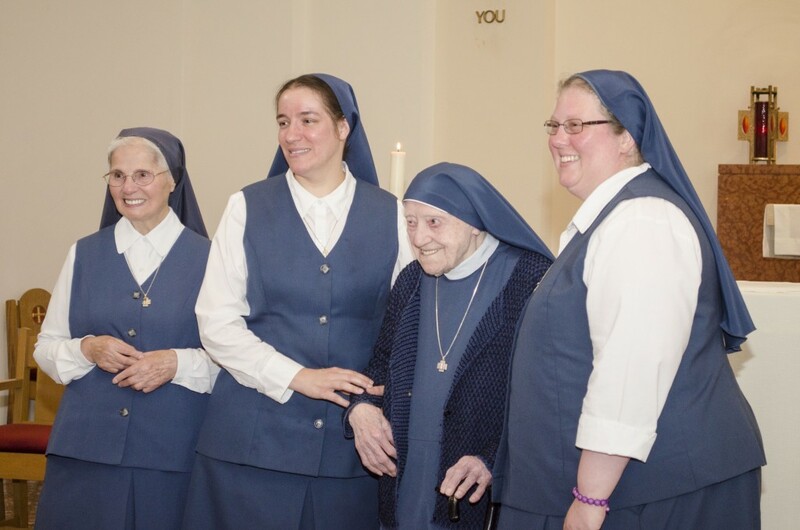 Your eyes are not deceiving you…our beloved 99 year old Sr. Mary Augusta Biolchini, FSP, part of the Senior Sister Community in Boston, made her first profession in 1940, when Pope Francis was only three years old. 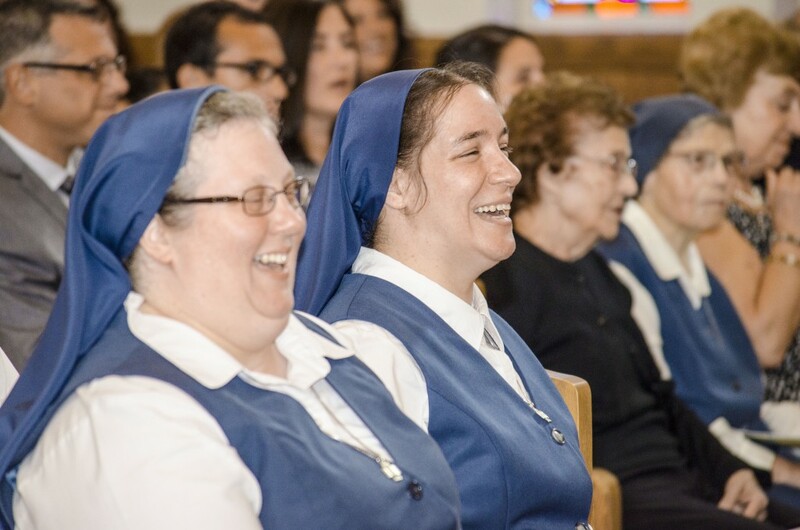 Although the mention of Sr. Augusta’s length of service usually draws the biggest gasp from listeners, we were blessed to reflect on the affirmative Yes that four sisters gave to God and on the fruitful and blessed union of their lives to Him ever since. Sr. Mary Leonora Wilson, FSP, the Provincial of the Daughters of St. Paul in the United States offered on the occasion the following words to each of the jubilarians. 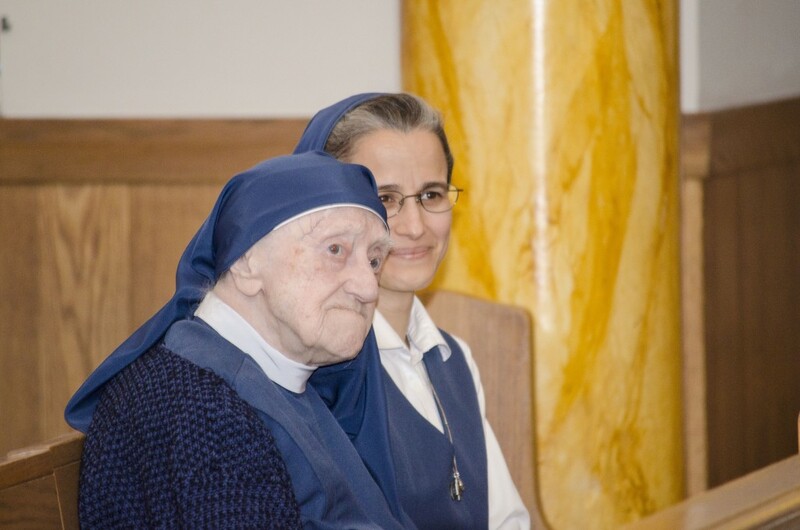 Sr. Augusta, 75 years of joyful dedication to Jesus and in a country not your own! With characteristic cheerfulness and serenity you have spent your life living and proclaiming the love of Christ. 75 anni di vita religiosa, 99 anni di vita – in tutti questi anni il Signore ti ha amato e tu sei stato tutto Suo, una con Lui, proclamando la parola di vita. Auguri grande e la promessa delle nostre preghiere. Sr. Mary Agnes, yours is the joy of 60 years as Christ’s bride and apostle of the Word of God, following Him wherever He chose to lead you, letting yourself be sent in His name to people all across these United States & Canada. His Yes to you found echo in your repeated yeses to Him in mission. May Christ’s love carry and support you, transforming you always more into Himself. Sr. Mary Jerome, Sr. Hosea Marie, the silver landmark has been reached: 25 years of religious profession. In these years you have already experienced that baptism into Christ’s death which is essential to any real life in Him. And Christ has proven His fidelity over and over again, inviting you to draw ever closer to His heart, giving you a share in His very own mission of evangelization through communications media. Your response has been creative and generous. May the Lord continue to be your All for the rest of your lives. If you like to read the full text of Sr. Leonora’s remarks please click here. Fr. 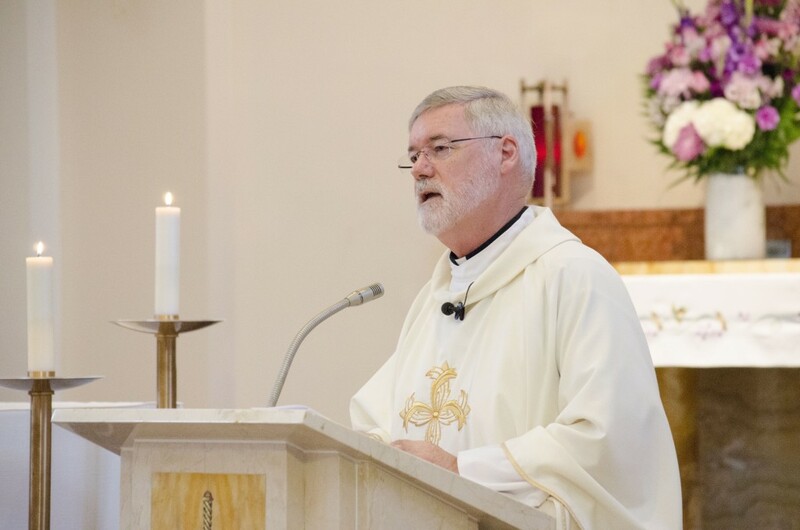 Michael Goonan, a priest of the Society of St. Paul was the Main Celebrant of the Holy Mass. 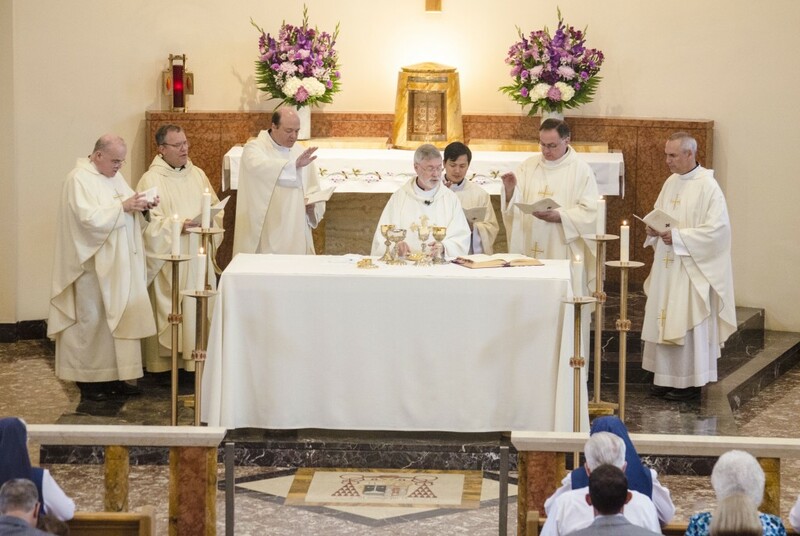 Priest friends of the Sisters concelebrated the Mass. Sr. Hosea and Sr. Jerome enjoying a moment of Fr. Goonan’s homily. Sr. Mary Agnes listening intently. Sr. Mary Augusta and Sr. Carmen Christi (Assisting Sr. Augusta during the Mass). For more pictures and a Slideshow of the Holy Mass Click Here. For more pictures and a slideshow of the Post Mass Family and Friends Photo Shoot and Reception Click Here.